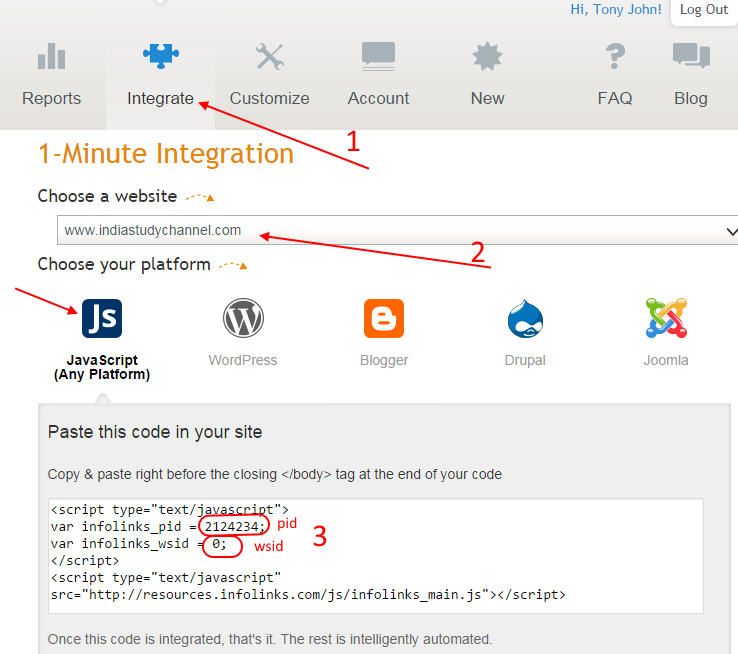 Read this to learn how to integrate InfoLinks with this website. If you have an account with Infolinks, you can add this site to your Infolinks account and then provide the Infolinks details to us to start earning from Infolinks through your content in this site. In the registration form, there is a field for website url. In that field, provide your special profile url (http://www.UttarakhandSpider.com/infolinks-profile/[Your User Id].aspx) as your website url. After your application is approved, you can login to Infolinks account and then click on "Integrate" tab to generate the ad script. You will see the Infolinks integration script. You cannot use this script directly. All you have to do is, copy the Infolinks pid and Infolinks wsid from the script. Save the pid and wsid into this page. 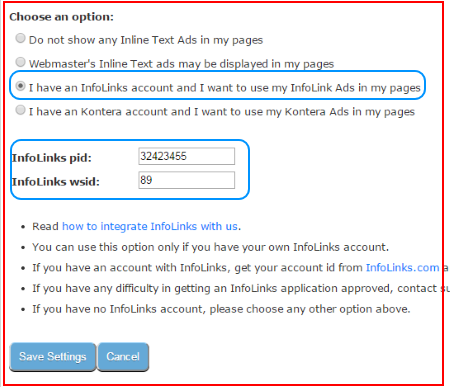 Choose the option "I have an Infolinks account and I want to use my Infolinks Ads in my pages" and then provide the Infolinks pid and wsid in appropriate fields. You are all set. If your Infolinks account is approved, you will start earning immediately from your content pages. Remember the actual earnings depends on the traffic to your pages and the number of clicks on your Ads. There is no need to contact Infolinks support team asking how to integrate your ad script with this site. They will not able to help you with the integration. You cannot use the ad script as it provided by Infolinks team. Instead, you have to follow the steps above to complete the integration. If your Infolinks application is rejected, you may mail them and show them the information mentioned in your profile page - http://www.UttarakhandSpider.com/infolinks-profile/[Your User Id].aspx and remind them that you are applying for Infolinks account as part of a revenue sharing agreement between this site and Infolinks. If you already have an Infolinks account, you just need to add your profile url (http://www.UttarakhandSpider.com/infolinks-profile/[Your User Id].aspx) as a new website in the existing Infolinks account. Infolinks application with the reason "you do not have full access to your HTML source code"